I love easy meals that look and taste like a million bucks. I can make this meal in thirty minutes or less, it tastes great, and it is nice enough for weeknight guests. Bonus! 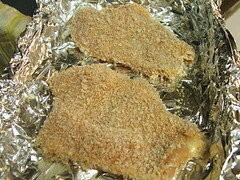 During the week I refuse to fry, so when I want something super crunchy I turn to my oven and panko bread crumbs. The Japanese deserve an award for creating these super-versatile crumbs. Not only do they add terrific crunch, they brown beautifully and make the food look very appealing. This meal is not fancy, but it takes the stress out of weeknight meals. I can tell you this has saved me from the dreaded pizza delivery man many times. The chicken is versatile and can be turned into chicken sandwiches, or cut smaller and made into nuggets. 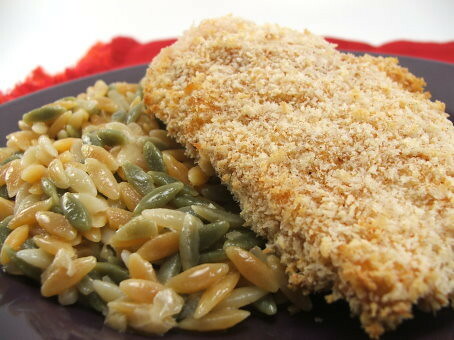 You can even freeze the chicken after breading, but before baking. Just bake for an additional ten minutes or so. Serve this with a salad, or some steamed veggies, and you will have a super easy supper! Heat your oven to 375 F. Line a sheet pan with foil and spray with non-stick spray. 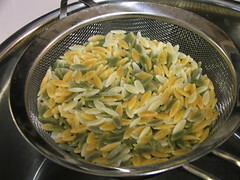 Also begin heating a large pot of salted water for the pasta. 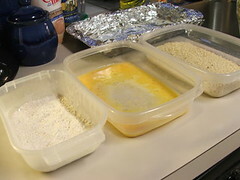 Prepare your breading by combining until well mixed the flour, salt and mustard powder in a shallow dish, the eggs, water and hot sauce in a second dish, and the panko and paprika in a third dish. Pat the chicken dry then dredge in the flour, making sure to tap off any excess. Second, dip in the egg, letting the excess run off. Third, dredge in the panko and coat well. 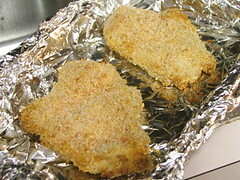 Move the breaded chicken to the prepared baking sheet. 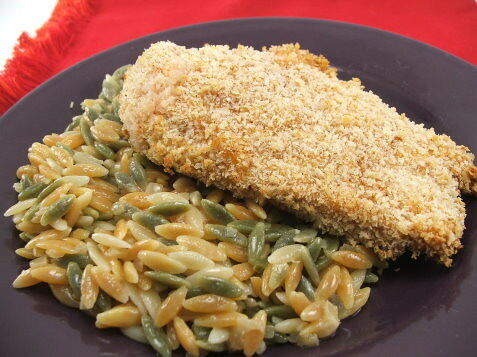 Bake the chicken for 20 to 30 minutes, until the internal temperature in the thickest part of the breast is 160 F.
While the chicken bakes prepare the orzo. While the orzo cooks begin the sauce. 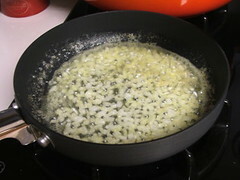 In a small saute pan melt the butter over medium heat. Add the onion and cook until soft, about three minutes. 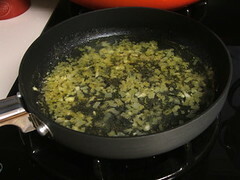 Add the garlic and cook for thirty seconds, or until fragrant. Add the wine and increase the heat to medium-high. Allow to reduce by 2/3, about ten minutes. 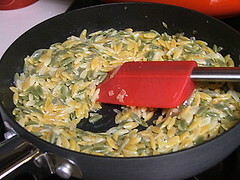 Once reduced add the cream then toss in the orzo. 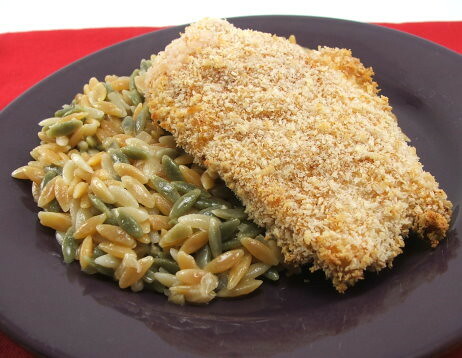 Serve the chicken with the orzo and enjoy!